SlotsMillion is a real fan favourite. Since its launch in 2015, it has consistently provided players with masses of slots, the latest gaming innovations, and an intuitive platform with user-friendly navigation. Although the service is still in its formative years, the site looks incredible when accessed on a mobile device or via desktop, and the interface is kept likably basic. As part of Alea Gaming, SlotsMillion is licensed by two separate authorities: The Government of the Netherlands, Antilles and the Malta Gaming Authority. This should convince a player with any doubts that it is fair, reliable and won’t take chances with clients’ money. Alea has always specialised in quality casino games and excellent slots. 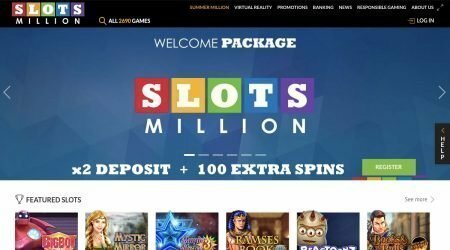 At SlotsMillion, the company has put together more than 1,000 titles to keep fans occupied, with contributions from many of the world’s best-known online gaming providers. By choosing a name like SlotsMillion, the company needs to deliver, and it does, with numerous opportunities for big wins on progressive slots. 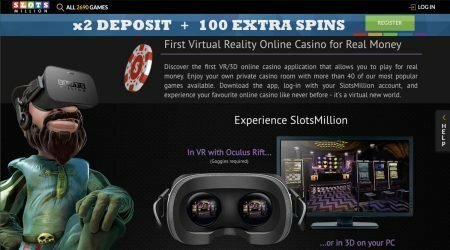 Whether members are looking for their favourite classic games or want to try out the latest virtual reality releases, there is plenty of choice at this casino. Casinos know that players love a good deal, and that’s why the best ones are always ready with bonuses to make their service more attractive. At SlotsMillion, fun new bonuses are made available regularly to make things more exciting and to deliver the kind of variety that keeps people coming back for more. The Happy Hour bonus is available every Friday. To take part, players need to visit their lobby and log in between 7pm and 11pm. If they have won a prize, then they will be notified immediately. Possible bonuses are related to deposits – they include an extra 20% up to a value of £20, 30% up to a value of £30, 40% up to a value of £40, and 50% up to a value of £50. Ladies’ Night is on a Monday at SlotsMillion, and for all deposits made by its female account holders between 7pm and 11pm, the casino provides a 25% bonus up to a value of £25. The minimum deposit required is £25. For its male clientele, SlotsMillion has dubbed Wednesday evenings Gents’ Night. Between 7pm and 11pm every Wednesday, male players will earn a bonus of 25% on each deposit they make, up to a maximum of £25. For the Ladies’ Night and Gents’ Night bonuses, the bonus cash needs to be used within three days of receiving it, and bets are limited to a total of £3. Once a player has created an account with SlotsMillion, they are offered the casino’s Welcome Package. This consists of a matched deposit of 100% up to a total of £100 on the first day, along with 100 extra spins. These are broken down as 20 extra spins that can be taken immediately, 20 that are available the next day, and 20 more each day for the next four days. 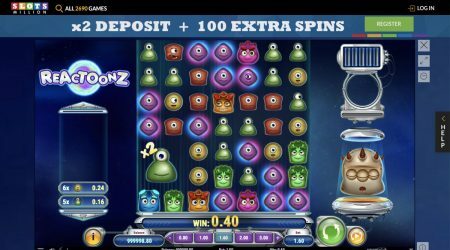 On the first day, the extra spins must be taken on Gonzo’s Quest; on the second day, the slot is Twin Spin; on the third, it is Jack and the Beanstalk; on the fourth, it is Spinata Grande; and finally, the fifth-day spins must be taken on Fruit Shop. Each batch of extra spins must be activated within 24 hours of them becoming valid and taken within seven days. Bets are limited to £3 when players have an active bonus, and the deposit bonus is valid for up to seven days after it is accepted. In general, the bonus has to be wagered 48 times before the casino will convert the funds into real money and allow it to be withdrawn. This goes for the Welcome Bonus, the Gents’ Night Bonus, the Ladies’ Night Bonus and the Happy Hour Bonus. For the free spin promotions, each spin must be wagered 35 times before any winnings can be converted into withdrawable funds. To brighten up its customers’ lunchtimes, SlotsMillion has created the Slunchbreak Bonus. This is available on the slots section and provides an extra 20 free spins for each deposit made between 11am and 1pm. Every deposit of £20 or more nets the player the 20 extra spins, and these have to be used within 24 hours. At most online casinos, players are presented with a wide selection of different games, including live dealer and table games, but SlotsMillion has chosen to concentrate on delivering the best possible range of slots. By any standard, there is a huge range on offer and many from software developers that include some of the industry’s best-known names. From heroes to horror, movies to mythology and adventures, almost every type of title is covered here. Plus, for the more experienced players who intend to make significant profits, there are search filters for special wilds, skill stop, double or nothing, and bonus game features. With more than 1,000 titles available to play at any time, an effective search function is vital. The casino has created a number of filters so that players can sort through the games, seeking those that are from a particular genre or have a certain theme. There is also a section that will search via the number of paylines that a game features. In the Jackpot area, members can take part in progressive jackpots by starting one of many different games. All the old favourites are here, including Wow Pot Lucky Clover, Mega Fortune and Mega Moolah. Virtual reality is still quite a new concept. It involves wearing a virtual reality headset and then viewing a game in a completely immersive way. So far, very few online casinos have adapted to the trend, but for players who own a headset or are willing to invest in one, SlotsMillion provides an authentic casino experience from the cosy confines of home. 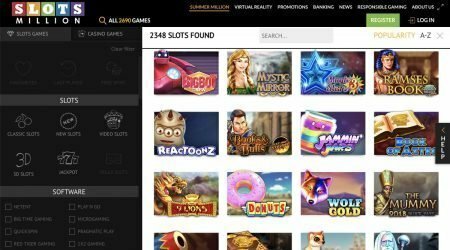 The digital casino games library is not huge, but there are around 40 games available, many powered by software providers with a great reputation. Microgaming and NetEnt have designed titles that are based on visiting a physical casino, where players can see the bar and a seating area, along with the slot machines. Audio and visual prompts encourage visitors to sit down and get comfortable, and then the game of their choice is displayed on a giant cinema screen. Once settled into the game, it is possible to use the 3D viewpoint to push buttons as if using a real-world machine. SlotsMillion was quick to team up with Oculus when virtual reality became more in demand and has created a number of special products that make the experience better for users of that particular device. This includes the ability to look around the set of a casino, taking in all the games on offer before settling on a title that appeals. When people use an online casino, it’s important that they get the chance to make payments and request withdrawals in a way that suits them. At SlotsMillion, there is a good range of payment methods, including Mastercard, Maestro, Visa, Neteller, Skrill, paysafecard and bank transfer. When a member requests their winnings, the fund will usually be paid into the method used to make the initial deposit. The customer service at SlotsMillion is something of which the company is very proud. Naturally, the casino wants to keep its customers happy and active in the casino, so the support team members are trained in all aspects of gambling before speaking to customers. To get people’s queries or questions resolved quickly, before the situation escalates, they claim to respond within a few minutes on the live chat feature. Answers are sent to email messages within 24 hours, and for customers who prefer to speak with an individual over the phone, SlotsMillion has a call-back service. To access any of these, account holders can click on the “Contact Us” tab near the bottom of the homepage. With two licences issued by a couple of highly regarded gambling authorities, it is clear that the games at SlotsMillion are above board. It also guarantees that its clients’ personal details are protected and their funds are stored in a safe holding account. To abide by regulations, the casino is obliged to keep a clock visible and provide details of wins and losses, so players are confident that the website is fair. Along with reliability, SlotsMillion offers lots of extra features that make the online experience more thrilling. There are regular bonuses and promotions, a massive selection of slots, and the chance to test out virtual gaming with games that boast plenty of realistic effects. The customer care team is highly responsive, and when people like to play on the go, this gaming spot is entirely mobile-friendly. For players who are dedicated slots enthusiasts or those who are keen to test out a more cutting-edge way to play, SlotsMillion is one of the most secure places to start.